Arranged over five floors including the basement flat, this spacious five bedroom Georgian house boasts a lovely garden with a study, five generously-sized double bedrooms and a large open-plan reception room. Kennington Road is located within easy reach of the numerous amenities and transport links of Kennington with Kennington Underground Station providing superb links into central London. 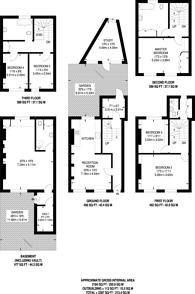 2,184 (202 Sq M) approx.